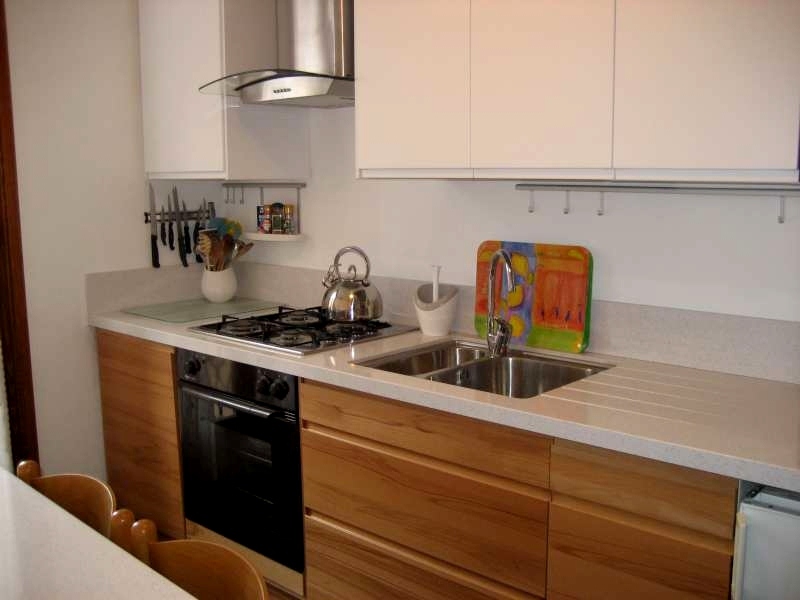 Situated in a quiet residential area of the Cannaregio district of Venice, yet close to all major amenities, this comfortable apartment provides an excellent location from which to explore the treasures of Venice or indeed further afield. The apartment itself is located in a 400-year old building in the heart of the Jewish quarter adjoining one of the historic old synagogues and close by the Museum of Hebrew Art. It is a fascinating quarter of the city and one of the few still principally occupied by Venetians and not given over to tourism. The style of furnishing in the apartment is typically Venetian with extensive use of tiled floors, simple white painted walls and a mix of modern and traditional furniture. The apartment is fully equipped and all linen and towels are supplied. All rooms have shuttered windows for guests wishing to shut out sun or noise. For comfort during hot weather there is air conditioning. Entrance to the apartment building is by secure entry phone or key only. The apartment is located on the fourth floor that is reached by lift or stairs. The apartment has wi-fi access. Entrance hall/sitting room with television and seating and gate-leg table for dining which seats 4-6. Leading to-Kitchen - This pleasant sunny room has full height French windows which may be left open giving an attractive view over neighbouring rooftops. It is self-contained and fully equipped with gas hob and electric oven, refrigerator, microwave, dishwasher and extractor fan. There are also a table and four chairs. Bathroom - comprising bath with overhead shower and shower screen, wc, wash hand basin with illuminated mirror/magnifying mirror and electric shaver point and bidet. A small washing machine for the use of guests is also situated here. A small hand held hairdryer is also available. Bedroom 1 - a quiet room with king size bed, bedside cabinets, linen chest, chair, double wardrobe and desk with chair. Leading to- Small storage/utility area with tumble dryer which guests are welcome to use. Bedroom 2 - a twin-bedded room with a wardrobe/drawer unit, and bedside tables, enjoying same view as from the kitchen. A five-minute walk from the apartment brings you to the San Marcuola stop on the Grand Canal. From here a number of waterbuses provide a frequent service to all stops along the Grand Canal including the Rialto Bridge, Accademia and Piazza San Marco and then on to the Lido. Newcomers to Venice will find that a relaxing tour along the routes of the giracitta (round the city) services and on the many services along the Grand Canal provide a delightful introduction to the city and its lagoon. 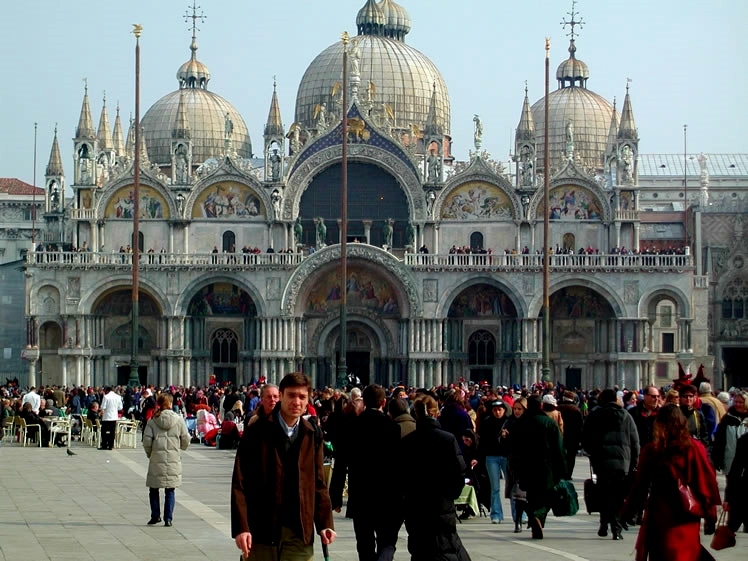 Alternatively take a leisurely 20-minute stroll to Rialto and on to St Marks Square which takes a further 10 minutes. Of course many areas of the city are only accessible on foot and Venice amply repays the visitor who takes the time to stroll through its labyrinth of calles (alleyways) and Piazzas (called Campo in Venice). Indeed one of the greatest pleasures in Venice is to take a leisurely walk along an unplanned route choosing calles and squares at random. Art lovers are well catered for with a seemingly inexhaustible choice of galleries and museums. Shopping for food and other day to day needs could not be simpler - there is a good variety of shops and restaurants close at hand and a daily market with excellent fruit and vegetables together with a fresh fish stall a hundred yards or so from the apartment. On the corner of the calle where you turn in to reach the apartment there is a wine shop selling wine by the litre direct from the flagons. The wine is excellent and cheap. Take your own bottles! Rental rates do not change with season. However, the lower rate is charged up to a maximum of 3 people. The higher rate is charged for 4 people (maximum number). On the day guests arrive and weekly thereafter throughout the period of each booking the apartment is cleaned and the linen is changed. For this service we ask you to pay a charge of €100 per week directly to our representative on arrival. Please note this apartment is not suitable for children under 12 for safety reasons. The main airport serving Venice is Marco Polo, from which it is a short bus ride to the city terminating at Piazzale Roma. An alternative airport is Treviso, used by Ryanair, from which a dedicated bus service timed to coincide with flight arrivals and departures runs to Piazzale Roma. Visitors coming to Venice by road or rail arrive at Piazzale Roma or Venezia, Santa Lucia railway station (Ferrovia) respectively. From both these points travel to the apartment may be continued either on foot or by water bus numbers 4.2 or 5.2. A map will be provided showing the route on foot. If taking the water bus get off at the stop called 'Guglie', (Obelisks) which is the first stop after the water bus turns left off the Grand Canal. When you get off the water bus you will see nearby 2 bright red fire hydrants standing either side of the entrance to a narrow alleyway. This alleyway is Calle del Forno. Turn into it and the main entrance to the apartment is about 100 yards down on the right. NB The 4.2 and 5.2 services do not always run as far as 'Guglie' after approximately 9 pm in which case take the No 1 or 82 to the railway station stop called ‘Ferrovia'. See map for route on foot from there. Within Venice water buses or walking are the best ways to get about. If you would like to visit other cities in the Veneto region or even further afield it is best to go by train. The railway station is close by and provides an excellent and reasonably priced service. My husband & I have stayed in this Venice apartment on two occasion's and have found the owner very professional, helpful & always replying to our emails promptly. 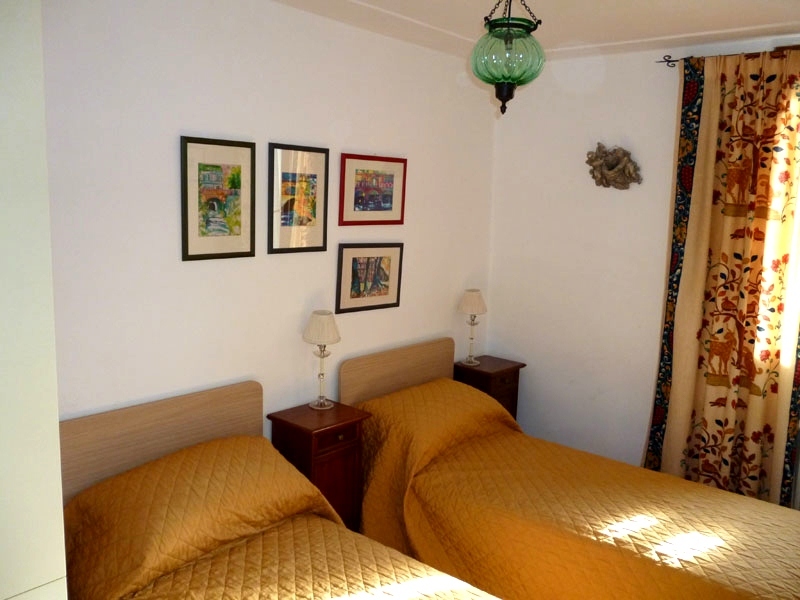 The apartment is in a great location on the canal & close to the railway station. Several times a week there is a fish market down stairs near the canal & we bought fresh fish which we cooked in our apartment kitchen. The photograph's & description of the apartment are true to what greets you when you arrive, the apartment is very clean & although we ate in local restaurants most days we appreciated the little extra ingredients left by the owner & previous guests. There is a small collection English speaking of movie DVD's for guests & the free WiFi connection was very good. I would not hesitate to recommend this apartment & hope my husband & I can stay there again in the future. We met Marcelle and her husband when she brought us the keys of the apartment, and they are very nice and interesting people to start with. 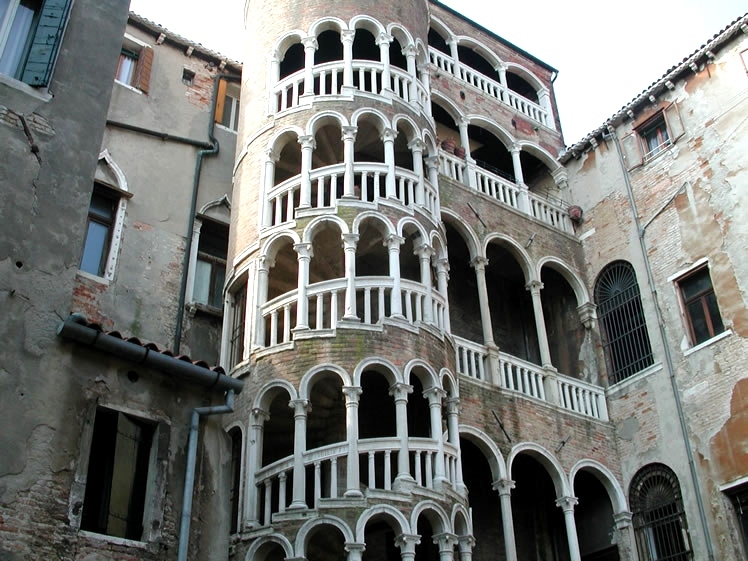 The apartment itself is in Cannaregio - the best area of Venice we think. It's away from the tourist crowds but still very well located - difficult to beat. At less than 200 meters there was the very strategic Guglie Vaporetto stop which showed very handy. In the Cannaregio area we found absolutely exquisite restaurants where mainly locals go. Because location was so near the Jewish Ghetto we had the best pastries, bread, etc. We had also lovely authentic little shops - excellent local wine-bars and gelateria at hand. The apartment itself was very charming, comfortable and practical. There was a heat-wave when we were there, but the air conditioning helped us perfectly through. Bedding is superb so we slept very well. A lot of practical information and tips inside the apartment and a perfect communication with the owners were extra trumps for this jewel of an apartment. We liked the area so much that we decided to buy an apartment ourselves in Cannaregio, and Marcelle and her husband gave us valuable advice! Venice is our favourite city and although we have visited it a few times previously this was our first time staying in an apartment and self catering which I would thoroughly recommend. We stayed here for five nights and would hope to stay here again in the future. All went smoothly both with IVHE and communication with the owner and the apartment is well positioned for access to and from the airport via the water bus and generally to get around the city. Enjoyed our stay, Venice is a lovely city. This property was accurately descibed and we had no problems either with communicating with the owner or finding the flat. It was very well appointed and strategically situated with respect to canal travel. The information about transport Etc. was very iuseful as the Venice tourist board is totally unhelpful about maps, timetable Etc. We can thoroughly recommend this propertyin every respect. can visit it (old Jew quarter). It is very interesting. clear and very helpful. We enjoyed very much being there. Thanks to the IVHE that made our stay possible very smoothly. 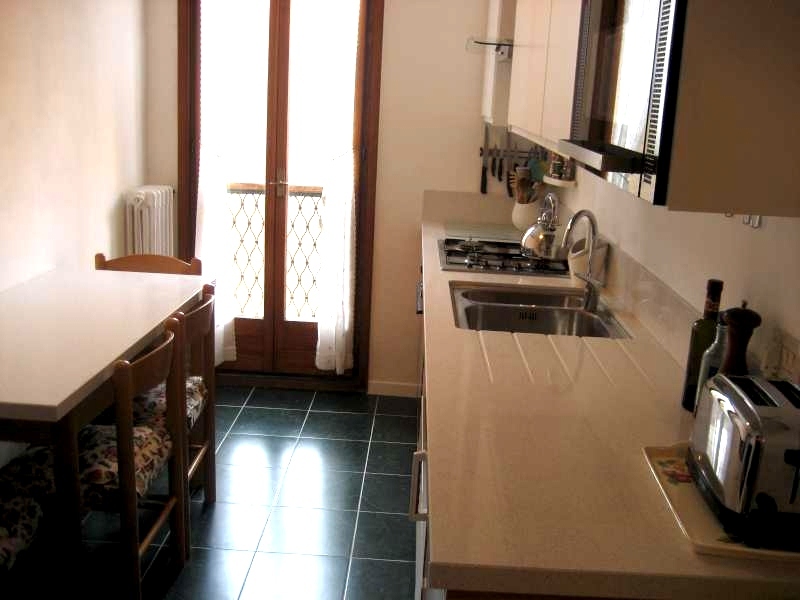 A great apartment for a small family or couple central located ... Modern kitchen and bathroom, all you need for a base in Venice. Try Gam Gam just around the corner and fresh fish stall an supermarkets close by. This was my second visit to this wonderful apartment I was alone this time and flat safe a all times in the apartment and within the neighbourhood. the wifi is a wonderful addition,apartment clean an all appliances modern. Local area the ghetto is wonderful an once again frequently went to Gam Gam:). you won't be disappointed great base conviently located. Located in a quiet spot away from the hubbub of Venice, yet with easy access by foot or vaporetto, this delightful apartment was a pleasure to stay in. It is well-appointed and has all the character of this wonderful city. Venice is just as beautiful in January: cold, of course, but it only rained on one day during our week. Much easier to walk around and see everything, and the flat in Cannareggio is wonderfully cosy to return to. All the street markets are open (fish, fruit, veg) and are a stone's throw from the flat. 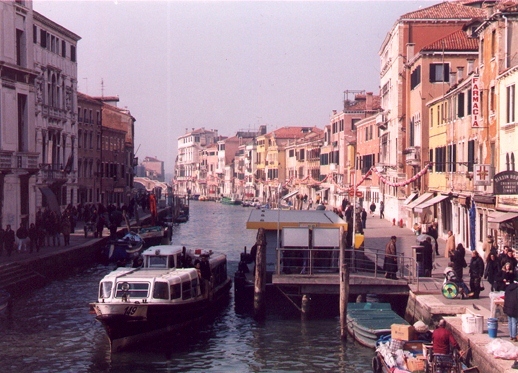 The photos show the Guglie vaporetto stop and the fish market in Cannareggio - right by the flat. (There are bars, baker, small grocer, wine shop, restaurants along there too).And, when strolling around, there is plenty of hot chocolate, hot wine and cakes at this time of year. At present the carnival costumes are in the shops too - to buy or hire - and a couple of photos show these. Carnival dates depend on Easter: this year it will run from 26 January to mid-February. Another advantage of Cannareggio is that the train and bus stations are there. This time we made a day trip to Vicenza (which also has great art exhibitions) and on a previous visit we went to Padua. (Of course air travel to Venice is much cheaper in mid-January). Lastly, when the weather is clear the views are better than ever! We found this to be a delightful little apartment a little off the beaten track. This suburb is very original and you can see a bit of real Venetian life by wandering its streets and canals. Venice has a kind of via dolorosa which winds through the centre and which in summer heaves with tourists. By far the best way to enjoy the city is to learn how to avoid this pathway by criss crossing it through the back streets.We loved our morning coffee at the local bar where you can watch the early morning river life while fishermen sell their produce off a stall next door.The sun streams through some of the rooms over the rooftops. Very pleasant stay. just returned from great holiday, location perfect, quite but accessible with water bus at end of lane. 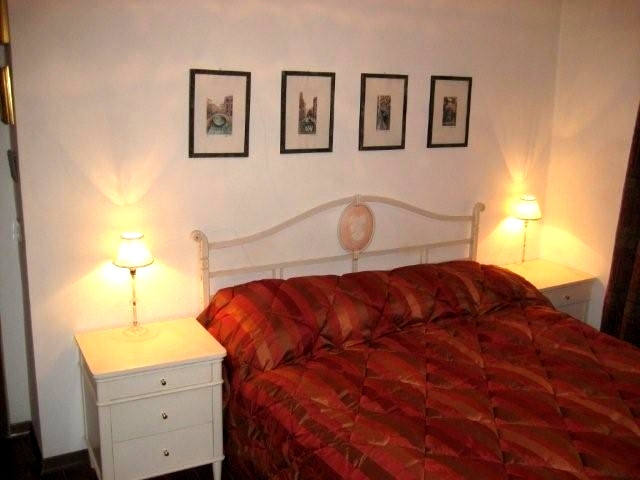 We had a wonderful stay in this compact, clean and well equipped apartment, situated in a delightful part of Venice. Its location meant that we could enjoy the local, authentic and untouristy restaurants, bars, canals etc nearby yet access the town centre easily by foot (approximately 15 mins at a leisurely pace). 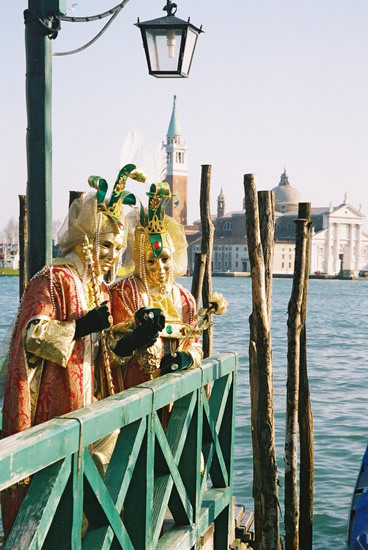 Carnival was great and we're so pleased we've had the chance to experience it with the opportunity of retreating back into lovely Canaregio when the crowds became too full. We found the location to be very good and easy to get around from. the area is not as noisy and busy as other areas in venice. The apartment is equipped well and easily accomodated the two of us. The owners sent a lot of helpful information. We would use this location again if it were possible. It is nice to have a little more space than just a hotel room and this allowed us to do some cooking which was great. We thoroughly enjoyed this old apartment in Venice. It is in a fascinating area - the Jewish quarter - and even has one of the passageways that the Jews used to move around when they were not allowed to go out at night. The area is generally non touristy, and authentic. The apartment is very close to the ferry stops - worth taking the one which goes all the way round the outer part of Venice and the lagoon. The apartment is really small, but has everything needed. Perhaps it might feel a bit tight for four people staying, say, more than a week. But a wonderful base. So much to see and do in Venice! And I even managed to keep up on my elbow crutches - but not something I would recommend with all those cobblestones and bridges. The two of us had a most lovely time staying in this cozy and small apartment in Venice. 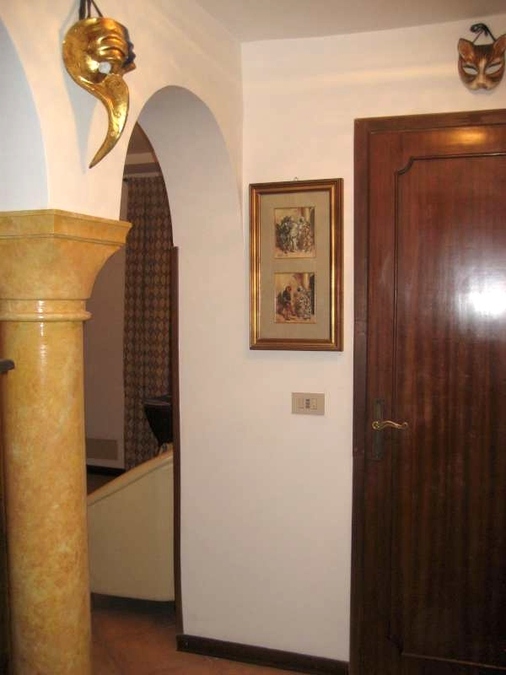 It is a perfect little pad to use as a base whilst exploring the many sites to see in and out of town. There are so many lovely little food shops nearby, especially, the inexpensive yet ‘sessionable wines’ sold in liter bottles for so little Euros. (We recommend for red wine, trying Malbec; for white wines, we liked the Pinot Grigio, and surprisingly, Chardonnay). Also, like the local wines we could so easily find just outside of the apartment door, the Mortadella was amazing in quality. Seafood available was breathtaking - clams were really fresh, as were these Dover Sole-like flat fishes. Staying here we really felt like the locals. Thanks so much for this experience! We really enjoyed it, we thought the flat was fine for 4 people, everything was very well organised. I appreciated the owners emails for info, and her sending the keys by courier to me, this was very convenient as I did not have to think 'where I'd get the keys from'! It was a bit of a walk from the flat to the city, I think it was just a bit more than the owner had told me (If I remember well she had said about 15-20', I think it was a bit more). However, as I enjoy walking it was not a real problem for me; there were just a bit of whinging from the male side, especially after dinner and a few drinks! I believe for the required credits the flat is good. I would recommend it to friends for sure for a good-value stay, but to be honest if I went to Venice again I would chose to stay closer to the center, nothing to do with the flat though, just for convenience sake! I am looking forward to the next stay with IVHE!